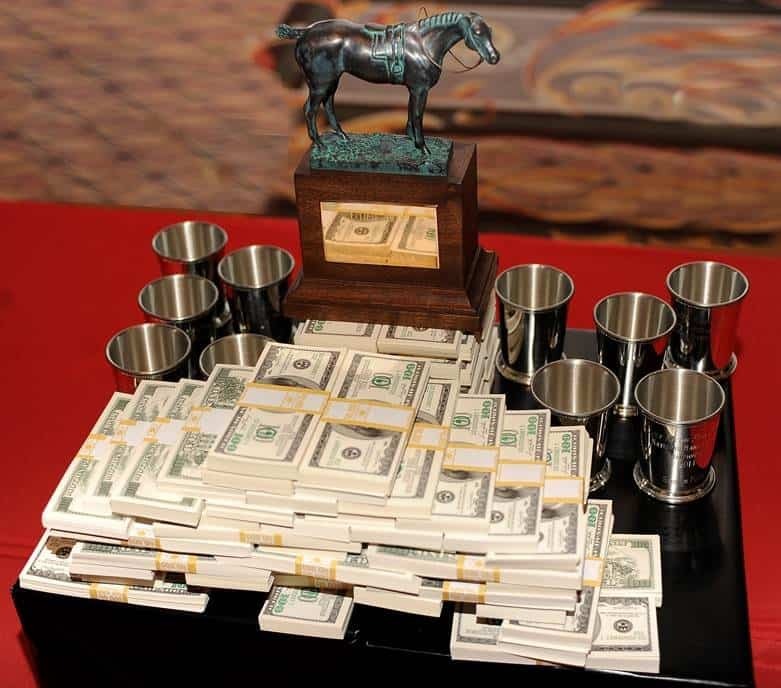 LAS VEGAS (Monday, January 25, 2016) – A record field of at least 627 entrants will compete for the largest purse in handicapping tournament history – estimated at $2.75 million in cash and awards – and horse racing’s official title of “Horseplayer of the Year” at this weekend’s 17th Daily Racing Form/NTRA National Handicapping Championship (NHC) Presented by Racetrack Television Network and Treasure Island Las Vegas. The three-day tournament, Thursday to Saturday at Treasure Island, will offer a first-place prize of $800,000. The final purse and field size will be determined Wednesday morning depending on registration for the “Last Chance” qualifier at Treasure Island. The overall estimated prize pool, including money already won by top finishers in the 2015 Daily Racing Form NHC Tour, represents a 5.4 percent increase over last year’s then-record purse of $2.61 million. Jonathon Kinchen, the 2015 NHC Tour winner, will play for a $2 million bonus on top of the $800,000 grand prize should he become the first reigning Tour winner to annex the NHC. The tournament field will be reduced to the top 10 percent of players after the first two days. The highest 10 cumulative scores after the Semifinal round will fill out the Final Table. Bankrolls amassed during Day 1, Day 2 and the Semifinal round will roll over to the Final Table, with the 10 finalists settling the NHC score in seven “mandatory” assigned races. A full scoreboard will be updated regularly at NTRA.com, where fans and players can also find each day’s contest race menu and news updates. Additional news and exclusive content will be shared on Twitter via the official NTRA account, @NTRA, where a four-person #NHC Social Media Team will cover every aspect of the news, personalities and culture of the handicapping contest world. A live stream and news updates will be available throughout the contest at DRF.com’s NHC page. At the Races with Steve Byk will broadcast live on Sirius XM satellite radio from Treasure Island during the show’s regular hours, 9 a.m.-12 p.m. EST, Thursday and Friday mornings, while bonus coverage from At the Races will be available Saturday at NTRA.com. Defending champion John O’Neil – who has been battling cancer and skipped the Jan. 16 Eclipse Awards ceremony where he was honored as “Horseplayer of the Year” to conserve energy for the NHC – heads the record field, which is comprised of 511 individual players (116 are dual qualifiers playing the maximum two entries) before the additional “Last Chance” qualifiers. As the 2015 DRF/NTRA National Handicapping Championship winner, O’Neil, of Huntington Station, N.Y., received an automatic berth into this year’s tournament to defend the title he won last January when he bested 605 other entries. Then 74, O’Neil won by amassing a mythical bankroll of $327.20 from a total of 47 Win-and-Place wagers pared from a mind-melting menu of more than 150 races run at seven different tracks. O’Neil will seek to become the first-ever two-time winner of the NHC, as will six other past winners that have qualified. The other qualifying champions: Jose Arias (2014), Jim Benes (2013), Michael Beychok (2012), Brian Troop (2010), Richard Goodall (2008) and Stanley Bavlish (2007). Meanwhile, Kinchen, of Austin, Texas, will hope to make NHC history of a different kind. As the winner of the eighth annual Daily Racing Form NHC Tour in 2015, the 33-year-old handicapping phenom not only earned $75,000 for leading the overall standings in the year’s NHC qualifying events, he is eligible to receive a $2 million bonus should he emerge victorious in this weekend’s competition. Therefore, a win by Kinchen in Las Vegas would result in a payday of at least $2.8 million ($800,000 first-place NHC purse + $2 million NHC Tour bonus). The 2016 NHC Tour kicks off Sunday, Jan. 31. Tour membership starts at $50 – premium levels carrying added benefits are available up to $95 – and participants can sign up at www.ntra.com/membership. In its 17th year, the Daily Racing Form/NTRA National Handicapping Championship (NHC) Presented by Racetrack Television Network and Treasure Island Las Vegas is the most important tournament of the year for horseplayers. There are no “buy-in” entries at the NHC. NHC players qualified via contests hosted by 41 racetracks, casino race books, handicapping contest websites, Advance Deposit Wagering (ADW) outlets, simulcast distribution networks, horse owner associations and other Thoroughbred racing organizations. The NHC 17 qualifier hosts were Arlington Park, BetAmerica, BetPTC, Bettor Racing, Breeders’ Cup Ltd., California Association of Racing Fairs, Canterbury Park, Century Bets, Del Mar Surfside Race Place, Del Mar Thoroughbred Club, Derby Wars, DRF Bets, Fair Grounds Race Course & Slots, Gulfstream Racing & Casino, Hawthorne Race Course, Hippodrome 3R (Quebec Jockey Club), HorsePlayersQualify.com, HorseTourneys.com, Keeneland, Kentucky Downs, Latin American Racing Channel (LARC), Laurel Park, Lone Star Park, Los Alamitos Race Course, Monmouth Park, Mountaineer Casino Racetrack & Resort, NHCQualify.com, National Thoroughbred Racing Association (NTRA), New York Racing Association (NYRA), Prairie Meadows, Public Handicapper, Race Track Warriors, Racetrack Television Network (RTN), Santa Anita Park, Tampa Bay Downs, Thoroughbred Owners of California, Treasure Island, TVG, TwinSpires.com, Woodbine Entertainment Group and Wynn Las Vegas. The tournament format for the DRF/NTRA National Handicapping Championship is meant to be the best possible test of overall handicapping ability. Players attempt to earn the highest possible bankroll based on mythical $2 Win-and-Place wagers. Assigned “mandatory” races – eight per day on Day 1 and Day 2 and seven at the Final Table – will be selected by a panel comprised of NTRA Director of Media and Industry Relations Jim Mulvihill, Treasure Island Director of Race and Sports Tony Nevill, Daily Racing Form National Handicapper Mike Watchmaker, and Daily Racing Form Advertising Director and longtime NHC emcee Eric Wing. The remaining 10 races on Day 1 and Day 2 and all 10 plays in the Semifinal round will be optional wagers on races at one of seven designated NHC tournament tracks: Aqueduct, Fair Grounds, Golden Gate Fields, Gulfstream Park, Oaklawn Park, Santa Anita Park and Tampa Bay Downs (which is dark on Thursday, when the contest will include races from the other six cards). On the NHC’s final day, the NTRA also will host an invitation-only online tournament, the 2nd Annual NHC Charity Challenge. A field of about 75 celebrities and racing personalities will compete to have $10,000 donated in their names to nonprofits including Old Friends, the Thoroughbred Aftercare Alliance and a cause of the winner’s choosing.